Change is in the air here are RC – but I don’t want to spoil it. Let’s see if you can figure it out from the post below. Speaking of which, some trends were already clear, but it seems as if one series is starting to gain a bit of separation in the dogfight for first place in the weekly rankings. One thing’s for sure, more series got votes this time than in any poll since Up to Snuff got started. 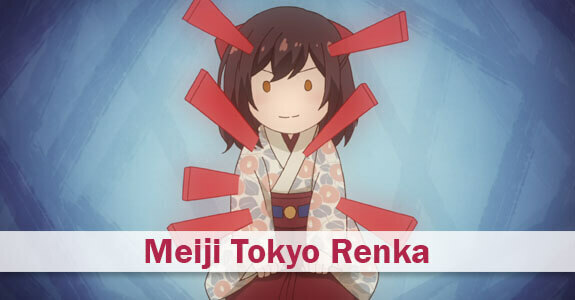 Zaiden’s Dark Horse Series: Meiji Tokyo Renka – As I religiously parsed through every single first episode of the season, I wasn’t convinced by Meiji Tokyo Renka’s otome slant. Some of my least favourite anime I’ve ever watched can be ascribed the otome tag, including La Corda D’Oro, Hiiro no Kakera, Brother’s Conflict, to name but a few. DEEN were also the studio that presided over two of these abominations, which didn’t exactly inspire my confidence. Fortunately, Meiji Tokyo Renka proved a cut above the rest of the shows I mentioned – particularly in terms of art, animation and soundtrack. But that isn’t everything. The female protagonist reminds me of Luna Lovegood, one of my favourite Harry Potter characters. Despite being a nice and bubbly girl, Mei is treated like a social outcast because of an ability to see spirits. After agreeing to take part in a circus magic performance by a really shady looking guy, she gets transported to Japan’s Meiji era. Coincidentally, her favourite past-time involves playing an otome game with Meiji-era men as harem members. More than just being full of silly cliches that would make you roll your eyes, the series has proven delightfully witty and humorous. It somewhat deviates from being historically accurate with a touch of supernatural mischief. But that’s really no problem, because it’s actually pretty fun and primarily driven through well-conceived character interactions. Well worth a gander, provided that reverse harem isn’t on your blacklist. 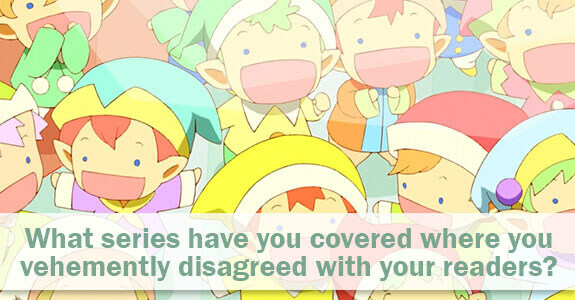 What’s the series you covered where you most vehemently disagreed with your readers? Stilts: Mahouka Koukou no Rettousei by a mile. I wanted to like it so much, I wanted another sci-fi show that rewarded deep investment, but it’s a stuffy engineer’s hard sci-fi with shite main characters (what’s their names, Magic Jesus and the brocon imouto), and I just couldn’t. I wanted personality, y’all! I wanted struggle! Powerful main characters can be amazing, but they need to be tested, and what’s-his-name never was. I was in the minority, though, or so it felt, because many commenters clearly enjoyed it. Distant second place goes to Comet Lucifer, which I tried to like for so much longer than anyone else, before finally succumbing to obvious reality and getting depressed by all the time I’d sunk into that trash fire. Choya:There might’ve been an episode of a random anime that had people disagree with my perspective, but I took too much time trying to give Cutie Honey Universe the benefit of the doubt. It ended up being a disappointment and one of the worst shows of the year, but I really wanted to like it because there was a lot of charm and promise to it and it was hot off the heels of Devilman Crybaby. Didn’t receive too many complaints, but the amount of comments I got alone say it all. I was probably one of the few people still trying to give the show a fair shake when it was already headed into dud territory. Pancakes: Probably Clockwork Planet for me. It was a series with intriguing ideas and strong origins (NGNL sequel when Kamiya Yuu? ), but a show which in practice unfortunately fell short of the mark. I really wanted to like it (not often we get imaginative steampunk after all), but in the end I just couldn’t find the excitement its small but loyal fan base thoroughly enjoyed. Personal opinion, terrible Pancakes taste? No idea, but I know it’s one series I probably won’t be returning to anytime soon. Guardian Enzo: This is a tough question, so screw whoever thought of it. For me I have a strong suspicion it may be Eureka Seven AO, a series I covered on this very site. In going with Aikawa Shou Bones pretty much guaranteed a sequel sharply different from Satou Dai’s charmingly scattershot original, and thus guaranteed a major schism with the fanbase. AO was the better series with the better protagonist, its flaws a matter of overreaching ambition rather than sloppy writing and execution. AO may have been too short, but E7 was too long – which to me is almost always a bigger problem. Honorable mention here would probably be something like Dansai Bunri no Crime Edge – a series which I think was high art but most readers just thought was crap. Passerby: Back before I joined Random Curiosity one of my favourite shows to write about was Darker than Black (obligatory plug of the season). Now, the first season was uncontroversially great, but the second season? Less so. Who actually liked Ryuusei no Gemini? Well, I did. Sure, it was a bag of flaws. Did it overreach by trying to tell twice the story in half the length? Of course. Do we feel the absence of Kanno Yoko’s gripping score in every scene? Absolutely. But it still stands, to this day, as one of the most interesting magical girl anime ever made. I may be the only one who thinks that, though. By which I mean I blame you guys for the distinct lack of DtB3. Zaiden: Because Enzo said I’m a chef’s egg, I get to talk about a series I didn’t cover to completion. Unfortunately, I don’t get 10 cookies. Without a doubt, so far in my time writing for RandomC, the currently airing Girly Air Force comes to mind as the series where I’ve had the biggest difference in opinion with most commenters. I wrote 1000 words of criticism explaining why I heavily disliked the premise. Yet the comment section was filled with adoration, praise, and a request or two for me to consider providing coverage for it! I continued watching up till episode 3 to see if my opinions would change, before swiftly hitting the emergency ejection button. Sorry folks. While I might feel partial to shipfus , I don’t seem to have any affinity with aircraft waifus. Fellow person of culture spotted. 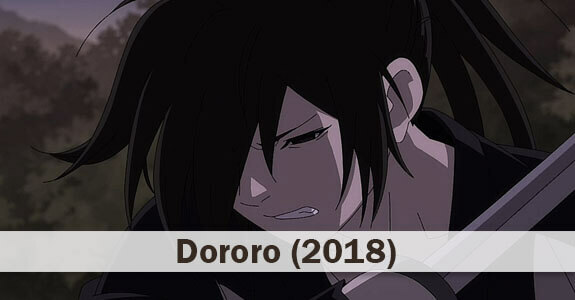 Just finished the latest Dororo episode. 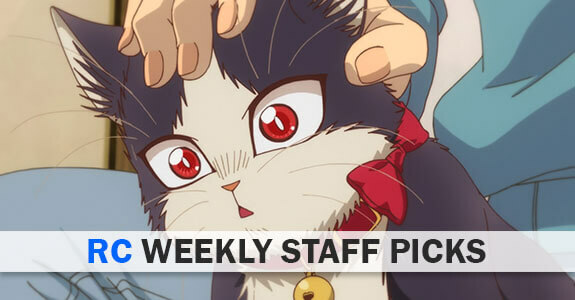 I think next week’s weekly staff poll will be unanimous. I liked DtB2 as well (and it’s not like I was all that nuts for the first season TBH). I thought Suou and July had a nice chemistry that added some warmth to a story that could use it. Watching the OVAs first probably did help. They did fill in a lot of things that viewers griped about at the time, and they do serve as a smoother transition between the two seasons. But now it’s three of us! Huzzah! Just for reference. Top rated TV anime airing this winter season. LOL Stilts!!! I was right there with you! Could not stand Mahouka Koukou no Rettousei and I absolutely loved your post The Ballad of Magic Jesus! I also loved that post. Made me chuckle hard. Probably one of Stilts’ magnum opus on the site. Y’all rock!! And yeah, while the Kyoukaisen mega posts may be more my calling card, The Ballad of Magic Jesus might be my single favorite post on the site. Best, who knows—but, that I got as much enjoyment out of that final post is, in the end, the only saving grace of having watched that show. Blogging banzai! When I saw that episode, I muttered “WTH flying Jesus with a gun”. Went to RandomC and burst out laughing as Stilts had the same idea!! Reading your posts was more enjoyable compared to Sasuga Onii-sama’s increasingly overpowered attacks. A real sleeper for me is えんどろ~! While story progression !== character growth, this silly series has quite the charm about it. expected. I like! It’s solid humor that you can take to the bank! cats to be found, and their owners were real people. There was a real accomplishment there! @Zaiden — Girly Air Force. It’s got girls. Kinda reminds me a little of Infinite Stratos. It’s one of those shows where, if you put your brain in neutral, it’s entertaining. I tried man. But I just prefer my shipfus, I guess. Dororo has been amazing so far. I have high hopes that it continues its trajectory well. It has the potential to be a 9 or, dare I say it, a 10. I’m surprised Enzo. I remember the deep divergence between you and the readers on Iron-Blooded Orphans. If E7 AO was worse…that is really really bad. That would be another one in the mix, but I tried to limit myself to series I actually blogged all the way to the end. If I opened it up to the field it was be an embarrassment of riches (Shigatsu wa Kimi no Uso certainly comes to mind).